If you saw my last post you know that I was going to make something that I had seen on Facebook for a party I was going to. I thought it would be a really quick thing. WHAT IS WRONG WITH ME? Never, when I make a recipe for the first time, is it a quick thing. Also, I was reminded why I never melt chocolate. I don’t know how. I think the hotter the burner/pan/water the better. NOT THE CASE! 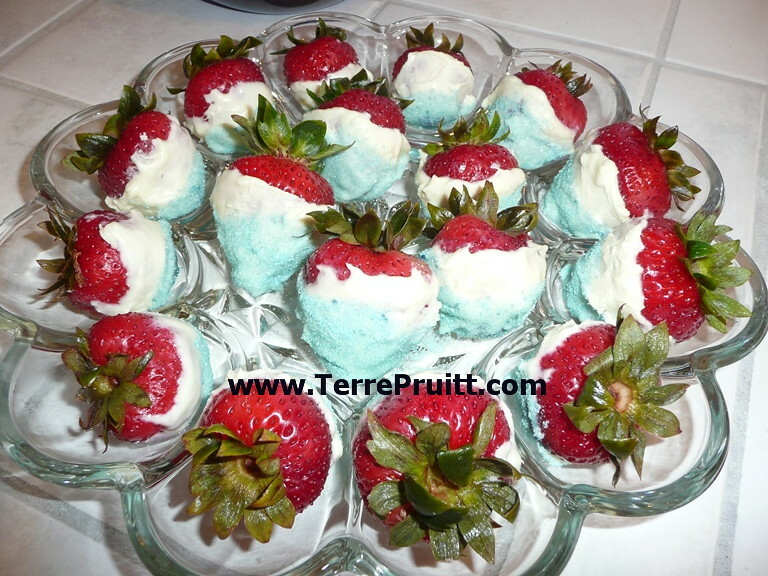 So I attempted to make pretty Fourth of July Strawberries. Well, I ended up with yummy strawberries, but they were far from the pretty picture I originally saw on Facebook. Also, they took WAAAAAAAAAAAAAY longer than I thought. I started later than I wanted which had us arriving at the party WAY later than I wanted. But . . . . that is what I get. And I really do know better. I just thought . . . . wrong, obviously. So I made Champagne 4th of July Strawberries. The “recipe” is here along with some things I learned and/or experienced. Perhaps this will help you when you attempt to make them next year. Wash the strawberries. Put them in the jars, fill the jars with champagne. Seal the jars. Let the jars set in fridge at least 24 hours. 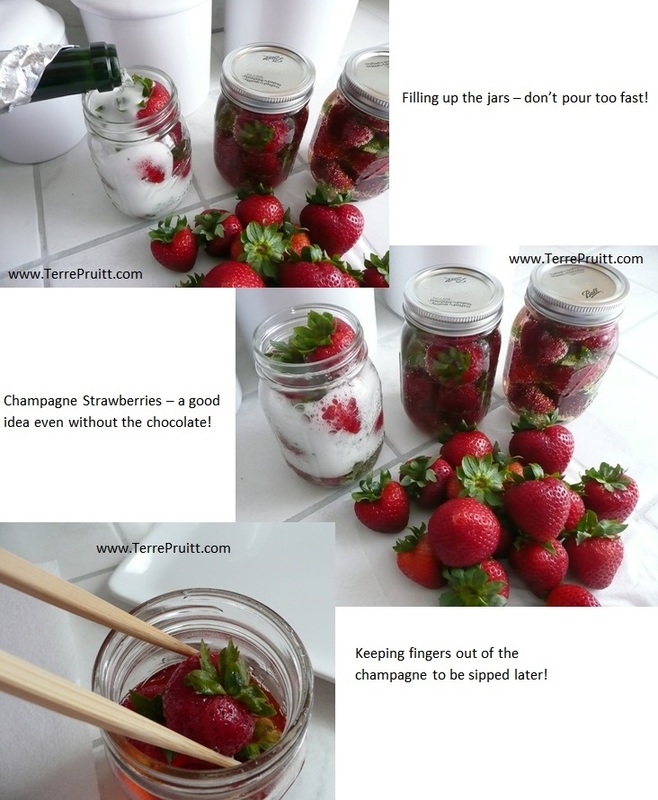 When you are ready to make the dessert, take the strawberries out of the champagne and let them dry. (The dryer they are the better!) 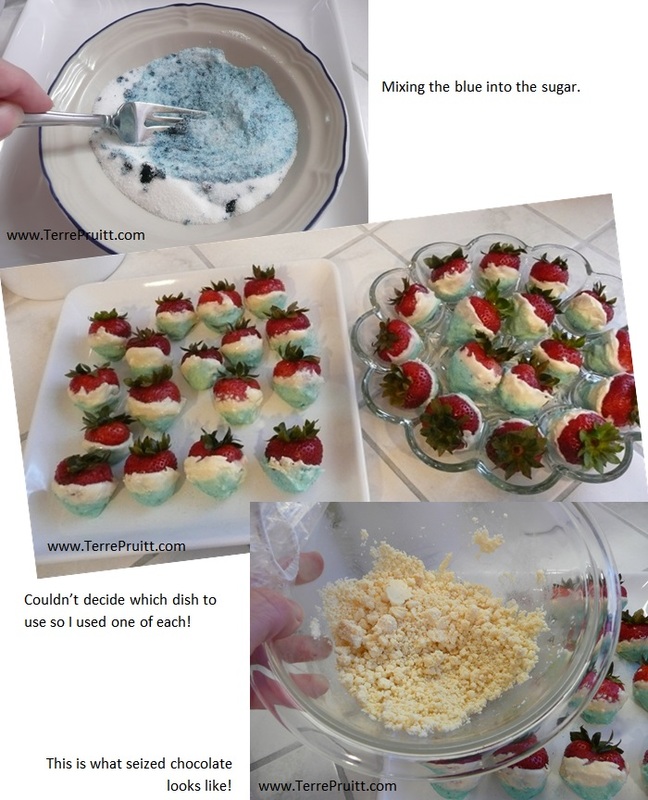 Mix the food coloring into sugar. Melt your chocolate. Dip the strawberries in chocolate, then the sugar. Place on serving tray. So, originally I used chop sticks to remove the strawberries because I just didn’t want to stick my fingers in the champagne because I was planning on drinking it later. Only with the first jar. Once one jar was empty of strawberries I poured the liquid in it and then just plucked the strawberries out with my fingers of the remaining jars. I set the strawberries on a paper towel to dry. I patted them “dry”. They DID NOT dry. The chocolate did not really want to stick to the strawberry. I ended up having to SPREAD the chocolate on each strawberry. So I would spread, then stir, then spread, then stir all the while battling my “too hot” chocolate. After the first tray my husband walked by and bravely said, “Can I do anything to help you?” And I made him stir while I spread the chocolate on the rest of the strawberries. I prepared WAY too much sugar. So that is why I did not give an amount in the above “recipe” because I have no idea. I later saw something that said 1/4 of a cup. I think I make 3/4 of a cup of sugar. Also, I couldn’t find any type of sugar in the store besides powdered, regular, and extra fine. So I just used regular sugar. I found that pouring the sugar on worked well. I used a spoon to pour it on the end of the strawberry. Although, I think if you properly melted the chocolate and waited a bit before dipping in the sugar, it would be fine. But with my seized chocolate (see I knew WHAT it was doing, I just didn’t know WHY) the pouring method worked great. Put the strawberries down where you want them to remain. Once they were on the tray they were NOT moving. Again, that could be because of the overheated chocolate. I will try this again. In fact, I didn’t use all the chocolate so I am going to attempt it again. Although I am using my seized, crumpling, leftover chocolate . . . so we will see. The people at the party were very kind and said the strawberries were pretty. I think they were admiring the colors not the texture. And then once a bite was taken it didn’t matter. Chocolate, whether white, milk, dark, or semi-sweet, on a strawberry is really yummy. So these were ok. Not the pretty thing I envisioned, but they were yummy. And I learned a lot. I look forward to my next attempt! So, how was your Fourth of July? Does a white chocolate dipped champagne strawberry sound good to you?